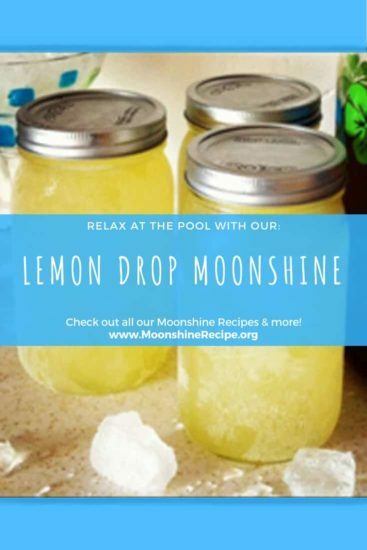 Here’s a lemon drop moonshine recipe that anyone can enjoy. And you don’t need a still to make one! Sure, sounds like a shortcut, but the pleasant citrus tang atop the hefty spirit hit will make it up in full. The ingredients are easily source-able from any grocery store, preparing and mixing the moonshine takes about 30 minutes, so it’s definitely worth trying it out. Just make sure to keep the mixture in the fridge for a couple of days at least. The longer it sits, the mellower is the taste. Pre-heat water to about 86°F. Mix the sugar into warm water with a spoon until is completely dissolved. Let the mixture cool to ambient temperature. Pour in Everclear and lemon juice. Let the mix mature – the longer it stays the mellower it gets but feel free to get a taste test! 3 Great Ways to Enjoy Your ‘Shine! If you’re the type who likes to keep it classic and pay their respects to the ol’ fashion way, these cheap mason jars are great for storing your bulk moonshine and sippin’ on! A neat twist on the classic mason jar style. These pour spouts make it easy to share and prep drinks from your stash in a jiffy. A super fun way to pass around taste testers, or go round-for-round with your buddies. These little shot glasses match the theme great with their mason jar inspired design! Yes absolutely!! People Love it with Vodka. Can I get away with using bottled lemon juice? You can get away with it, but it just won’t be as good as good ole fashion fresh squeezed. Do you have to seal the jars? You DO need to seal the jars so that outside air doesn’t get in, this allows the flavors to meld during the steeping process. can this sit in a cabinet or does it stay in the fridge? Can you make with a home made simple syrup of different fruits in season? how do you seal jars? does this have to be stored in mason jar with the lids or can it be stored in empty booze bottles with caps? Can the jars be sealed in a water bath? How long? I put it in empty glass booze bottles or canning jars and keep it in the refrigerator or freezer. I’ve kept the apply pie moonshine in the frig for over a year with no problem. It is better if you store it in a dark cool place. Doesnt need to be in a fridge. Also if you add a cinn stick when cooking, it will help take some “bite” out of it if you cant wait to drink it. I have never sealed any of my moonshine jars. I fill them to the top. The everclear will kill any germs in the jars. A hot bath in my opinion is not recommended as the alcohol can start to evaporate. how many ounces does this make? Anyone ever put lemon drop candies in the bottom of the jars, if so how much do you put in? 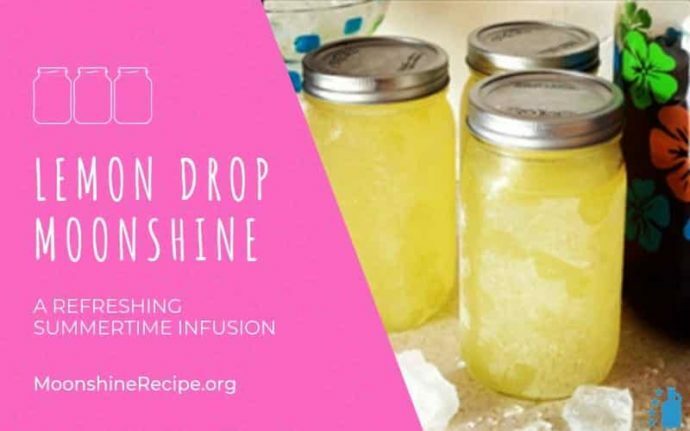 How much proof does the moonshine have to be for this recipe? Want an even nicer lemon flavour? Wash 2 lemons really well with warm soapy water and then rinse them clean. Zest both lemons. Get ALL of the zest, but make sure you don’t get any of the white pith underneath the outer zest. Put the zest in the Moonshine (or Everclear) into a glass sealer jar and let it sit for a month. Every day put the jar into the freezer in the morning and pull it out at night. This will pull all of the natural lemon oils out of the zest, and permeate them into the alcohol. After this month, then heat and mix your water and sugar mixture. Let it cool and add the lemon infused alcohol to the sweetened water. You may want to add more sugar if you like it sweeter. The natural oils from the zest give a much richer flavour than the lemon juice. Yes, this takes longer, and a bit more effort, but the end result is a MUCH better product. Fantastic recipe! Have had plenty of compliments and no complaints. Thanks Kimberly! It’s definitely one of the most popular! Can you/should you cut out lemon slices and seal them with the Lemonaide Moonshine?